Novelty items don't have to be useless. At Promotion Pros, we believe that novel and useful can go hand in hand, which is why we've developed a wide range of custom jotters. 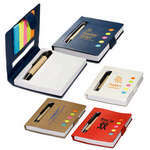 If you enjoy stylish notepads, you will find the Hayden pocket jotter pad to your liking. 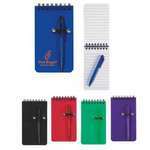 If your preferences are more colorful, our company logo novelties such as the pocket eco-note combo or the promotional spiral jotter and pen will be right up your alley. 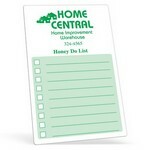 Our Magnetic Note Pad features magnet on the back and sticks easily to fridge and cabinets, Customizable with your logo for Brand Recognition. Let your imagination run wild, and then capture it immediately on paper with the Eco Easy Jotter Combo. 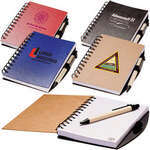 Add your company’s logo to the jotter combo and maximize your brand exposure at book fairs, conventions, and other events. Look good when taking notes in your class with the Eco Handy Jotter with Pockets and Pen Combo. This is an Eco-Responsible™ product and can be easily degraded. 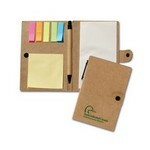 Eco Stowaway Jotter with Sticky Flags & Pen is an economical notepad with pen nested in it. The note pad has 80 sheets of 3" x 4" sized white paper perforated at the top. 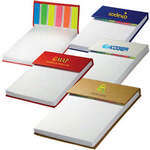 Hardcover Jotter with Sticky flags includes six assorted translucent sticky page flags and a 4" x 6" 100-sheet unruled white pad in a hardcover binding. The Sticky Flags can be used to make notes or leave messages. Our branded magnetic dry erase memo boards are thick and durable, with an easy-wipe, dry erase, high gloss surface. 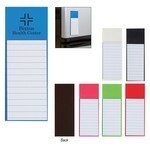 The promotional magnetic dry erase memo boards small is thick and durable with a high gloss surface. Pocket Jotter with Sticky flags includes five colors of 20 sticky page markers, one 1-5/8" x 1-7/8" yellow sticky pad and 40 pages ruled note paper. 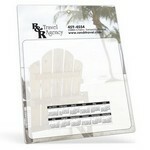 The translucent polypropylene cover features a 4-1/2" ruler. This Recycled Jotter with Post a Note and Flag Set includes sticky flag colored groups, sticky notes, unlined paper, and a pen. 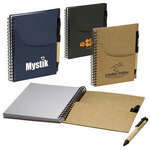 Imprint your company’s logo on the Spiral Jotter and Pen and watch your brand gain prominence in the advertising arena. It features a 50 page lined notebook, an elastic pen loop, and a matching ballpoint pen. 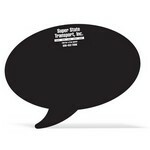 The promotional bubble shaped chalkboard decal allows you to write and erase endlessly on black chalkboard vinyl.